Moon in Cancer decides spontaneously and hold to their feelings. ♋ The significant aspect in this case is that the moon is to find in the sign which dominates him. Therewith moon in Cancer persons are particular sensitive. Emotionality and feelings are significant aspects for them and really taken for serious. Moon in Cancer decides spontaneously and hold to their feelings. They have the ability to adopt their coevals well and listen carefully to their needs. But their sensitiveness is easily to change and influence, so they turn to feel insecure and hurt. It is easy to make them unstable so that they could lose their balance – and to be stressed is a disaster for them. 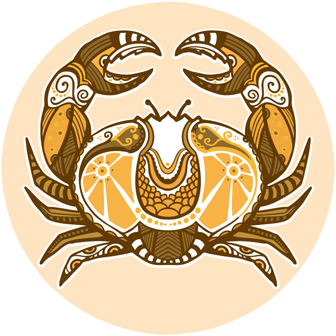 Moon in Cancer coevals are capricious and tend to retreat from daily social life. They are fond of having beloved people around them, to take care for them and they like to be cosset as well. A family and kids are particularly important to them. For love she needs time. Her confidence must be deserved. First she could be reserved and rejecting. But when you will have got her heart you will have an honest, faithful and romantic idealist at your side.